As many of us choose to wear less makeup during the warmer months, it's a good idea to start of by tackling any blemishes. This masque contains aloe vera, willow, rosemary and witch hazel. All of these natural ingredients are known for their healing properties and can help to reduce any problem areas. This masque left my skin feeling smooth and mattified. Mud based face masques are my usual personal choice as they seem to work really well for oily skin. Cucumber is well known for it's cooling properties and this masque is intended to cool down skin in the Summer heat. Peel off masques are a great way of removing impurities and dead skin cells. I have to admit that this one didn't smell too pleasant, it has a kind of medicinal smell that wasn't to my taste. However, the effects of the masque far out-weighed this. After removing the it (the bit I like best as it's just like when you're little and peeling PVA glue off your hands) my skin was noticeably refreshed and firmer. This masque is one that I preferred to apply whilst in the shower. It is an exfoliating masque that contains spearmint and dead sea salt. I found the level of exfoliation to be adequate for my skin , however it may not be right for those with super-sensitive skin who don't like heavy exfoliation. The masque also contains sweet almond and jojoba oils to hydrate the skin and after using this, my face was silky smooth and more radiant. Of all the masques this one was my favourite. It smells amazing! It's packed with blueberries and cranberries which means it's full of antioxidants and vitamins (there's even raspberries and grapes in there too). This masque is another one that's great for targeting blemishes. It also contains peach kernel oil and aloe vera; both help keep the skin hydrated and looking plump and youthful. 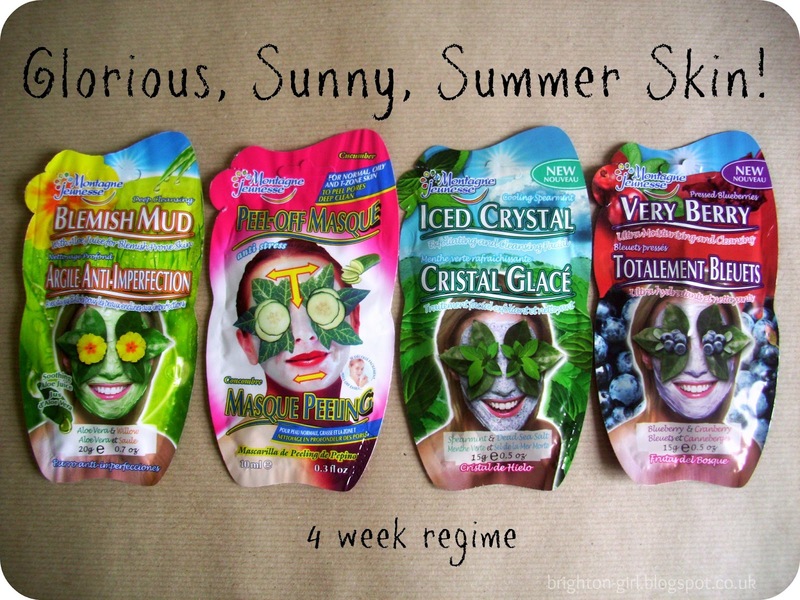 I wanted to publish this post while we still had some summery weather so I have used the masques more frequently than suggested. However, I've been impressed with each one and feel that they are well suited to common Summer skin issues. It's definitely worth tailoring your skin care with environmental factors in mind. As regular readers will know I'm a big fan of all things natural and there's no better way to treat your skin with the natural beauty products Montagne Jeunesse have to offer. All the masques are available at most major retailers such as; ASDA, Superdrug, Tesco, New Look and Morrisons (I even spied some in Primark the other week). They are priced at £1.09 each. What's your Summer skin care routine? I don't have any particular skin care routine just face wash,moisturiser and sometimes sea breeze. You can get them in £1 shops aswell! Usually on a multisave for a £1! 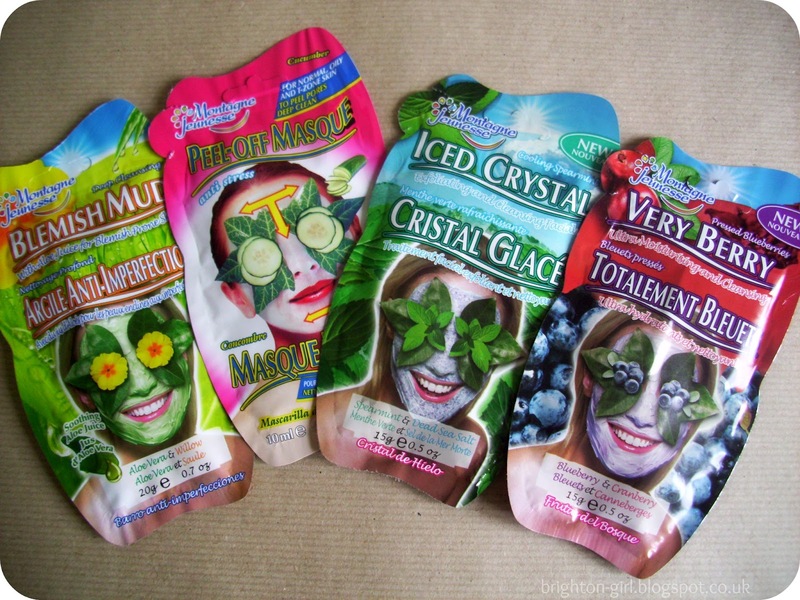 I love these face masks, and they are really good value! !